If you are lucky enough to get some Rock Striders when revealing Exploration Tokens, do yourself a favour and be aggressive! Rock Striders have a huge advantage at the start of the game thanks to their relatively high hit rate (50% on 4+) and exceptional speed (can move up to two hexes). Find some easy kills and move quick before your opponents collect enough rubium to counter attack. Rock Striders’ speed will give you great map control. If you can afford it, leave a Rock Strider on the Monolith early in the game for Energize Cards. If you’re lucky, you can get the rubium cards which will help you get loads of rubium since you will likely not have many rubium refineries in front of your base (because you got the free Rock Striders early). Are you scared of losing your Rock Striders, Lava Leapers, or Rubium Dragons? Give your army some padding with Humans! If you have to take a hit during battles you can sacrifice your Humans, or other miner units, rather than losing your costly units. This will make it very difficult for your enemy to pick off your stronger units. They will think twice before contesting with you. 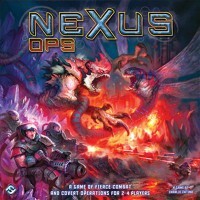 Nexus Ops gives the advantage to the aggressor when it comes to battles! I believe this because the rule book notes that if during YOUR turn you contest an enemy and completely wipe out the opponent, you get a Victory Point! Even if you lose all your units by the end of the fight, as long as the opponent’s units are eliminated you get the victory point. You need 12 victory points to win the game. 1 out of 12 points is 8.3% closer to achieving ultimate victory! That’s huge compared to losing an army. Of course, don’t go kamikaze without back up. I’m just saying it’s okay to over extend if you have a good chance in getting some victory points. If you have the edition of this game with the translucent minis, do yourself the favor and pick up a black light to play. Amazing times.